In the Australian outback sits a forest of spider-like antennas, gathering data from the distant reaches of the universe. It’s the Murchison Widefield Array, a radio telescope array that uses low-frequency radio waves to detect and study things like hydrogen emissions, the ionosphere, supernovae, and more. This summer, four UWM undergraduates spent a week building those antennas. Physics majors Rusty Mundorf, Kaleb Maraccini, William Fiore and Robert Bavisotto are all undergraduate researchers who work with UWM Physics professor David Kaplan. When Kaplan needed a crew to work on expanding the MWA, they each applied. It’s a small thing now, but it could generate big results later. The MWA is an international collaboration among several universities and organizations, each studying different astronomical phenomena. Kaplan’s group at UWM uses the data collected from the array and other locations to search for pulsars. Sometime in the future, the MWA, and the antennas built by the UWM students, might be able to use the pulsars to detect gravitational waves, ripples in the fabric of space-time predicted by Albert Einstein and recently proved to exist by a team from the Laser Interferometer Gravitational-Wave Observatory (LIGO), which included scientists from UWM. “It’s always interesting to see the practical side of science, and there is a sense of pride in seeing something that you’ve built after a week of work, knowing that someone will use it to study something meaningful in the future,” Fiore added. 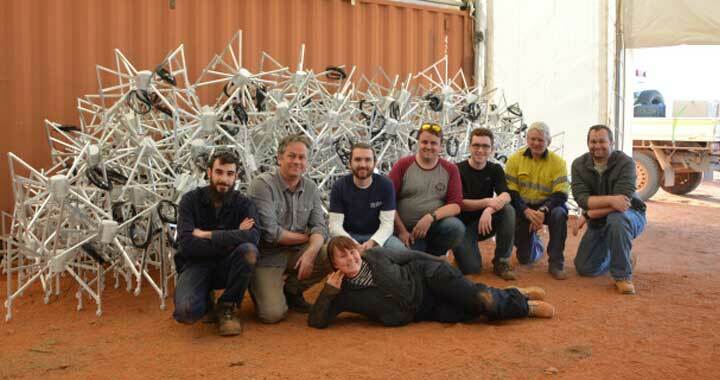 The students spent five days on the project in the Outback. The area around the MWA is a “radio quiet” area, meaning all radio transmissions, from car radios to microwaves to cellphone signals, must be silenced so they don’t interfere with the MWA’s data collection. The area itself is isolated and can only be reached via a long ride on dirt roads. 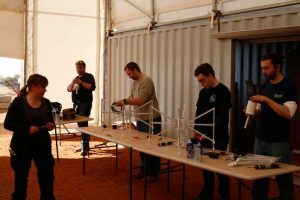 The work was repetitive, so much so that Mundorf bragged he could assemble a dipole antenna blindfolded by the end of it. He couldn’t, but did come close, he reported with a laugh. The students would be working on-site by 7:30 in the morning and work until about 4 or 4:30 p.m. The MWA involves miles of wire to carry data back to computers for analysis, and the instruments are very sensitive. That’s good for research but can be a problem when it comes to maintenance. Maraccini learned how the iron in Australian soil can corrode the array, especially during a wet season. After the project ended, Fiore and Maraccini stayed behind in Australia for more research while Mundorf and Bavisotto returned to the United States. The project was a cool opportunity for research, and one that will look great on a resume, Maraccini said.